Creating A Water Baby | For the Joy of Life. Oaklyn was a winter baby. She was born in February and I knew that we still had some cold Utah months ahead of us, but my heart ached for summer days outside. I hated being cooped up all day and craved sunshine. 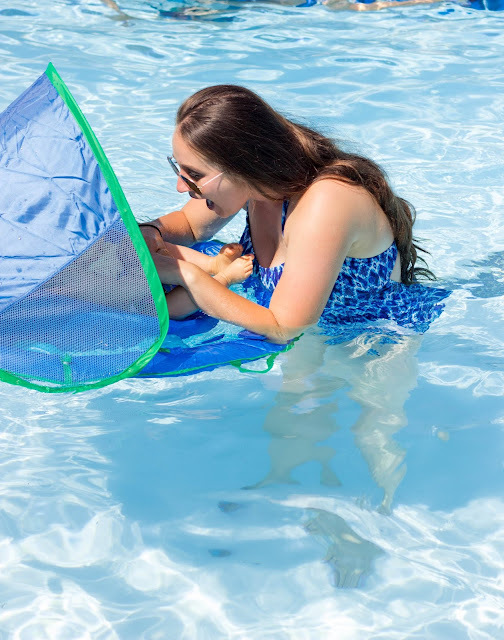 When summer arrived, I was SO excited to take Oaklyn swimming for the first time. 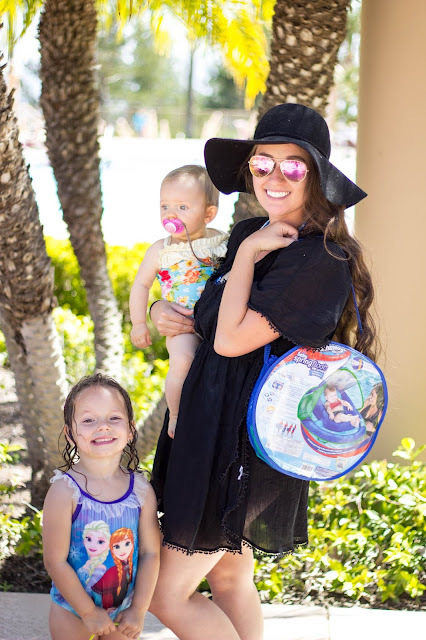 (Learn more about teaching your little one to swim on the Tach Me To Swim website.) I bought her a cute little bathing suit, made sure she had a swim diaper, packed the towels and snacks... I mean seriously, I thought it was going to be the best day ever. Oaklyn really liked her baths so I thought for sure she would love the pool. Turns out... she hated it. She stuck her little legs up when we tried to dip her in, she cried even if we held her, she hated the water hitting her face, the bathing suit kept falling down, and I was so sad! However, I should have stuck with it and continued to expose her to water. Instead, I just assumed she hated swimming and we hardly went the rest of the summer even though I LOVE swimming. Growing up, we swam a ton! My parents put us in swim lessons early on to ensure we were safe around large bodies of water and then we spent tons of time on different vacations where swimming was always on the agenda. We went to Palm Springs, Las Vegas, Hawaii, beaches in the South of France... I remember spending tons of time in the water. I was so bummed when I thought Oaklyn didn't love water as much as I did. After that summer, it took several other trial runs to get Oaks to like being around the water. She still pretty much hates when it is in her face and I had to bribe her to play in the splash pad last summer... but we have definitely made progress. I decided that I wanted to expose Cam to water in a positive way early on. We started with baths in a baby bather, moved to sink baths, and also let her play in the big bath. I always smile at her and show her how to splash and she just loves it. With summer on the way, I knew it was time to start introducing her to the pool. I wanted to create a positive water introduction experience with her and started trying to find ways that would help excite her. I knew I had found baby gold when I saw the SwimWays Infant Baby Spring Float. Not only is SwimWays an industry leader in helping children learn to swim, but they also promote water safety. The Infant Baby Spring Float is the most creative baby float I have seen yet. It has a sun canopy, it is fabric-covered, has a soft seat that cradles baby, and a 3-point harness to keep baby secure. To make mothers even more comfortable with bringing their babies into the pool, there are additional security features that include dual inflation chambers, child safety valves, and a wide base with an inner spring around the outside edge of the float for stability. I tried not to get my hopes up, but with this float, I was almost positive Cambria would have a really great experience. So, we loaded up the girls and took them to the pool with everything but the kitchen sink in the stroller... #momlife. 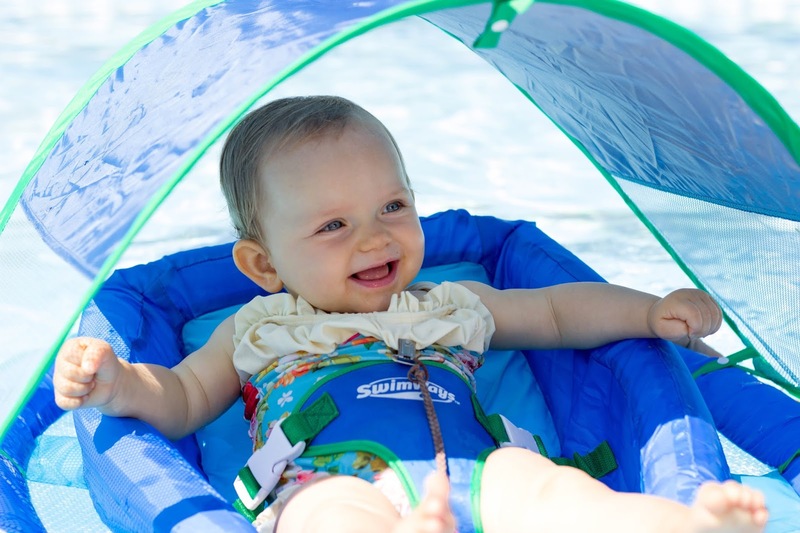 I got the SwimWays Infant Baby Spring Float all set up and was shocked how easy it was. Then, it was go time. I got Cam in her little bathing suit and we stuck the float in the water. I passed her off to Hunter who securely buckled her in and she was in heaven. She sat back and lounged while loving looking all around. She was also shaded by the removable and adjustable canopy with UPF 50+ sun protection. But the best part, was that I was having fun too! The float has built-in handles making it possible for me to swim and enjoy myself while also knowing she was secure and safe. Once Cam found the water with her feet, she was loving splashing and moving all around the pool. I didn't hear her cry once even though it was past her nap time. Not only did I have a great experience, but I know Cam did too! 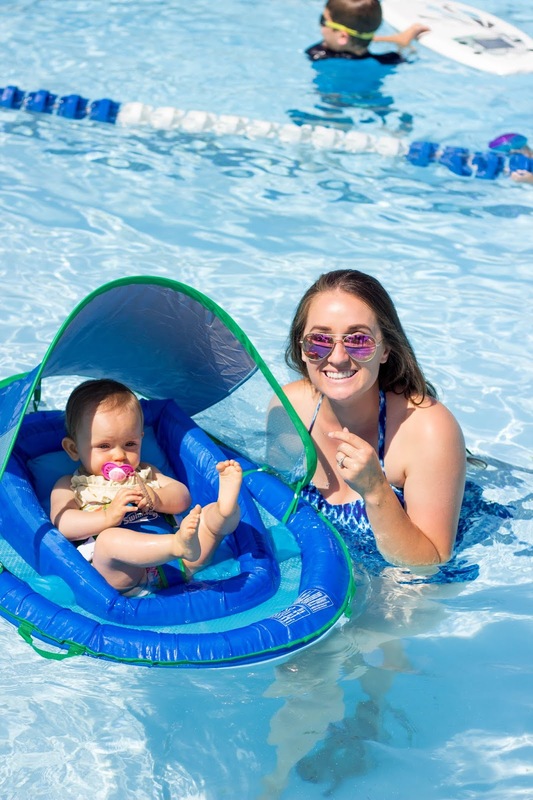 I was so excited to have the SwimWays Infant Baby Spring Float because I know it was key in helping create my little water baby. Now I'm so excited for summer and all the pool days we have ahead of us! 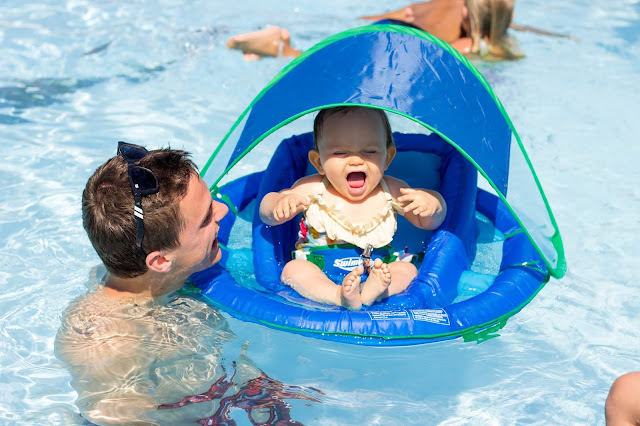 Where is your family swimming this year? Backyard, beach, community pool, lake, or a vacation?